Welcome and thank you for joining us at Rail Spike Woodworks. 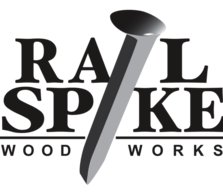 We at Rail Spike Woodworks pride ourselves in manufacturing products that reflect railroad decor. Our products reflect functionality and durability with a unique appearance in their combination of materials. We hope you enjoy your visit to our website and thank you for your interest.